All transactions are safe and secure with a reliable history in online purchasing behind each of our associates. 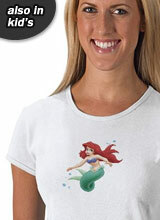 Buy the Bubbly Ariel t-shirt to own Little Mermaid clothing and merchandise. King Triton's youngest daughter is the bubbliest of the bunch, so draw attention to her upbeat trait with this bubbly Ariel t-shirt. It is available in a wide variety of colors, sizes and styles for women, men and children, so it doesn't matter who you are shopping for. Pick the combination that best suits the fan in your life to put a smile on their face in no time. If you are looking for more ideas that would light up a little one, see the Sebastian t-shirt below and also check out the other items. You'll find lovable Disney Little Mermaid merchandise like toys, wigs and Sebastian plush stuffed animals. In addition to the Bubbly Ariel tee above, browse the Little Mermaid Clothing Gallery for more apparel like men's and women's clothes, kids shirts or hoodies.